Our dogs enjoy the country life with acres to roam, usually leash free. But sometimes a leash is necessary, either at home or when we take them off the farm. For those times, I use an assortment of leads, depending on the dog and the need at the moment. 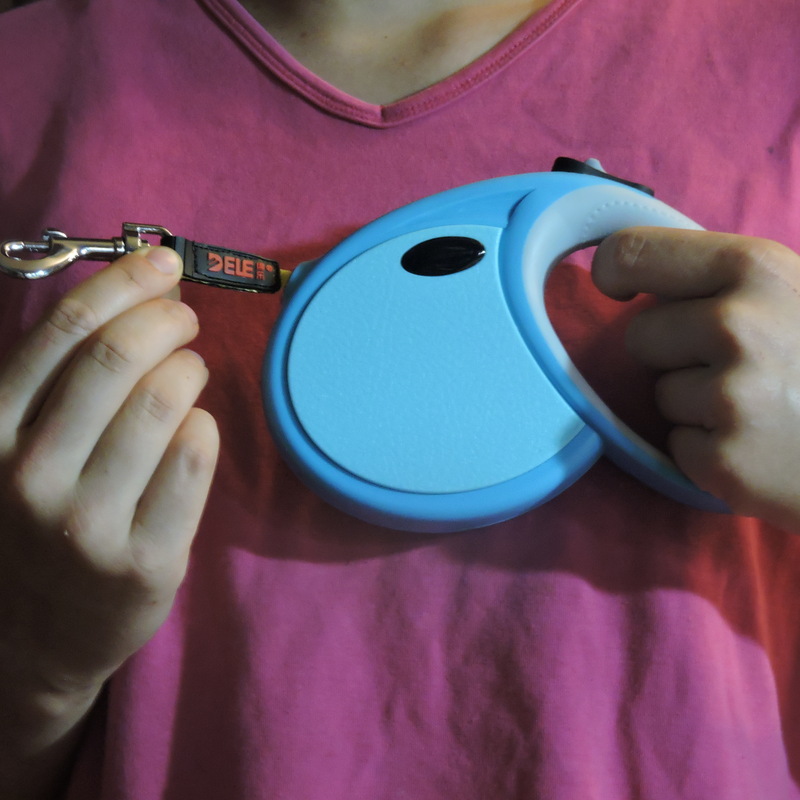 I was happy to be able to test the Retractable Dog Leash by Growpetz to see how it stacked up against our current leads. As a dog trainer, my first concern with a dog lead is how functional it is. Is it strong enough for the job? Easy to use for the human? Comfortable for the dog? Like any trainer, I have strong preferences for the equipment I use and while I like a lead to have a nice appearance, that is secondary to comfort and function. The Growpetz leash is indeed very nice looking. I like that it’s small and lightweight. The grip area is proportionate to the plastic leash container but might be a little small for extra large hands. The small to medium sized hands in our family fit very well and the grip is quite comfortable. I would consider it functional for most people. Being lightweight adds to the function; even a young child could hold it comfortably for a long walk without it seeming burdensome. The snap and flat style leash are both adequate for a small dog; it’s said to be for dogs up to 45 pounds and I think that’s probably reasonable, unless your dog tends to pull a lot. A reasonably trained dog should be fine. The leash does not pull on the dog’s collar and the dogs we tried it with (5# to 40#) were all fine with it. The adjustment button is quite easy to use and seems to be well constructed, as is the entire leash. Keeping in mind the size of the dog, I think it’s a good leash that should last a long time. It’s important to remember, however, that adjustable leash’s are not intended as dog tie outs, nor are they truly training leads. They are very well suited for casual dog walking where the dog is free to roam at the end of the 13′ leash and occasionally needs to be kept on a shorter leash for control or safety. I recommend the Growpetz dog leash for small dogs or dogs up to the manufacturer’s recommended 45#, if they are reasonably well behaved. Ours is now kept with our other preferred leashes, ready for it’s next use!